This past week in SWTOR has revolved around a few topics, Character/Server Transfers, Ranked Warzones & the possibility of SWTOR moving to a Free-2-Play model. Most of the news on the transfers has been very positive. The move itself was fast for players, even guilds…with a little coordination between members, without major issues. The main problem came with character names and Legacy names. Some had to change their names and Legacy names, upon arriving at the destination server. By consolidating servers, the destination servers have seen higher populations throughout the game and this helps players trying to get a group together for a Flashpoint or questing. Overall, I think Bioware did what they had to do and even though nothing is ever going to please all “gamers,” the transfers have to be marked as a success for the game. It has even given players a bit of that launch day feeling of excitement. Mark Maquire, from Gameplanet, has written a different article concerning the future of SWTOR. Many have heard about EA keeping an open mind regarding the various options for money-making models for this MMO…yes, this includes the Free-2-Play model. However, unlike everyone talking doom and gloom, Mark’s article discusses how EA, via Frank Gibeau EA’s Label boss, plans to have SWTOR in the MMO market for awhile…try a decade. Frank talks about, in the article, all the titles people are still playing and how he can easily see this game follow the same path of being in the market. Mark has written a great article and lays out exactly what Frank Gibeau has to say on the matter. Yes, the Free-2-Play model is talked about in the article. 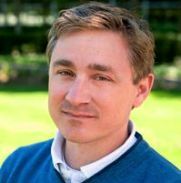 Be sure to go read the entire article and also check out the link to the source interview with Frank Gibeau at GamesIndustry International by James Brightman. I guess maybe, I’m a glass half full guy, but even if SWTOR goes Free-2-Play, that is not marking the end of the game. It does mean EA is being forward thinking to adjust to how things are shifting in the whole gaming industry. Many people forget EA has a big presence in the social media gaming side of things. There are millions of people playing several “free” games online at various social media hubs. Out of those millions of players how many people are paying money and how much? Just something to think about when you hear the term Free-2-Play, in regards to SWTOR. 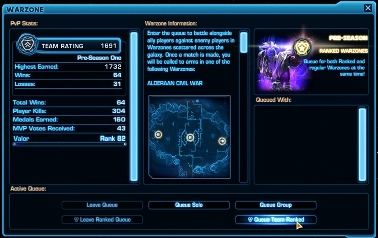 One of the major discussions since Patch 1.2 has been Ranked Warzones, or lack of them in SWTOR. Unfortunately they were not ready to be put into the live game for Patch 1.2, but it appears as if things are on schedule for Patch 1.3 to have Ranked Warzones. This past week Gabe Amatangelo was featured in a blog on the official game site. The topic he was discussing was all about Ranked Warzones. Besides talking about the inclusion of them in the next big patch, he also discusses the changes and added features to the Ranked Warzones. One of the neatest features has to be duel queuing. Players will be able to be queued for a Ranked Warzone and while they are waiting for that they can play a normal Warzone without impacting your place in the queue. It will allow you to finish the normal Warzone and then after it is finished your Ranked Warzone will launch. This sounds like a great way to keep players enjoying PVP while they wait for another Ranked Warzone to be ready. Another feature Gabe mentions is something that should have been in from beginning…the group of 4 for regular or 8 player group for Ranked Warzones will remain grouped after the match concludes. This eliminates having to track down your friends/teammates and regroup before queuing up for the next Warzone. Be sure to read up on the entire blog for all the details. Oh, and if you want to help improve Ranked Warzones head over to Public Testing Server and put the new features through the test. The latest Community Blog has several interesting links from players voting on their pick for next playable specie, to what song would your companion sing for karaoke and more entertaining forum threads. You can also nominate one of your favorite forum threads and it just might make next week’s Community Round-up. Below are listed a few server specific events going on…two of them are tonight, (June 21st, 2012) so make your way to the links below for complete details. Stay tuned for future details on another event coming this July for the Shadowlands server, which will be set in Outlaws Den with “historical” significance. Okay, I for one was stressing about the whole transfer thing. I am happy to report my stress was overblown for the character transfers. It went so much smoother than I could have imagined. The only issue I have would be lack of tools for guilds to transfer. Enough about me lol…How did transfers work for you? Now if you and your guild have been busy with transfers or just been playing more because of increase of people on your server, you might have missed some of the articles here at Corellian Run Radio. Don’t worry we have you covered. This past week’s articles are listed below for your convenience. Please take a moment and leave your feedback for our authors. We love to hear from you. This is a video by psychocrow from the official SWTOR forums. The video tells the story about a little “evil raid leader.” You can see for yourself in how this particular “leader” rules with an iron fist and does not tolerate any excuses from members in the raid. After watching the video, please leave your comments on whether this leader reminds you of any of your own gaming experiences. The Pandamonium guild from the Corellian Run server, (best name for a server), created the following video set around the Eternity Vault Operation. This is their take on SOA’s story set to the music from “Into the Woods.” This video is great. The lyrics and music are a great touch to convey this “interesting” story for SOA. Hands down, the “emote” acting makes this video something really special. I have watched many of these videos and this is some of the best editing in an acted out script. I want to thank Kaisa for emailing this video to us here at Corellian Run Radio. Take a look and leave a comment on what you thought of the video. The way games are being played has changed. Whether you are talking types of games, style of play or the tools gamers use to give them that extra little edge. So it just makes sense that the gaming mouse has been evolving. Now it is Logitech’s turn to enter their version of a gaming mouse with the MMO community in mind. The G600 MMO Gaming Mouse, according to an article at TechKnowbits.com, will have 12 programmable buttons along the side of the mouse. The G600 will come with 3 profiles that the player can customize to suit their gameplay needs. Logitech also includes its G-Shift function, found on many of their gaming keyboards, to increase the number of possible keybinds a gamer can setup for in-game or to help navigate the web to their favorite podcast or use with a variety of other programs. The article says the Logitech G600 will come in black and white and retail for $76.99 US dollars. What is your preferred gaming input device? 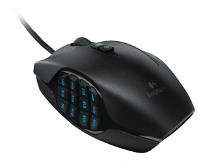 Do you see gaming mice like the Logitech G600 or the Razer Naga being a must to play MMOs or games in general? Let us know your thoughts in the comment section below. Is there a particular link, story, video, or topic related to SWTOR you would like us to highlight? Or maybe like Kaisa, you would like to share your creation with the community. If so please send them to us here at Corellian Run Radio and it might just be included in a future article. You can email us at corellianrun@gmail.com, or you can leave link suggestions in the comments below, or in the Facebook group. Thanks and see you all next week! @jamie I understand how the last minute removing of Ranked Warzones for 1.2 was not a good thing.